I grieve the loss of colleagues who have thrown in the towel and decided to leave professional ministry. Seven colleagues in the last 6 months. Five colleagues in the last 2 weeks. Each one led fruitful, effective ministry. All but two served in multiple local churches. One went through the process and was ordained. Understanding that some are called for a season and life changes make for priority shifts, I still grieve the loss of their leadership. According to an ongoing Lifeway survey, the average term of a children’s pastor is 3.6 years. The #1 catalyst which offers a longer term of service in the professional call into ministry: connection outside your own local church. Without one another, we drift. How far we drift depends on the relationships we build face to face, not Facebook to Facebook, or Instagram to Instagram, nor blog to blog. Social media is not enough. Building connection is time consuming, intentional, inconvenient, and uncomfortable. But O the value of sharing table life, a meal, a trauma, losses, disappointments, gains, ideas, celebrations, words of truth and encouragement with one another face to face . I mean truth like what was shared with me a few years back, “I don’t know why in the world you are letting that situation take up so much space in your head. Let it go, girl, let it go!” I let it go. I challenge each of you reading this to make building professional relationships outside your own house (local church) a priority where throwing in the towel is not even an option. Network with others regularly in face-to-face gatherings. Join professional organizations not for what you can get out of them, but for what you can bring to the table. Make gathering for lunch or breakfast a priority in your continuing education. Linked-in doesn’t count, social networking doesn’t count, face-to-face counts. If there isn’t a gathering in your area, call the church down the road a piece and ask to speak to their children’s ministry lead. Invite him/her to lunch, or tea, or coffee, or breakfast….share some table life. Start one. Go ahead….you can do this! Messy Church is a fresh expression of inter-generational worship, service, and fellowship experiences which values being Christ-centered, based on creativity, hospitality, and celebration. We used the framework for Messy Church for a Messy Family Christmas event last December for an afternoon event. Thirty minutes for creative activities; thirty minutes for inter-generational worship with familiar live music and a jacked-up children’s moment; thirty minutes for table life with a simple meal of soup, bread, and water. It was a huge success in registration of 100 and actually 120 in attendance. Our Missions Committee also used the Messy Church model as an opportunity to extend a Christmas blessing to families in need who are serviced by our food pantry and Teach-One-To-Lead-One missions in our local elementary and middle schools naming it The Christmas Table for the sole purpose of growing in relationships and sharing table-life with even more families in our community. After receiving permission to take on the four 5th Sundays in the coming year to expand the Messy Church model in our context, we chose to present a Messy Family Lent event as an opportunity to celebrate the end of our first Glee Club & Cherub Choir season on March 31st. What was different? We chose to offer it as a takeover for the first part of the 11am Sanctuary service where the children sang, signed, offered the call-to-worship as a call and response, and were flanked by worship art the children had prepared with six panels representing six scenes of the Lent season in the life of Jesus. The schedule included twenty minutes of familiar music (Jesus Loves Me; This is the Day) including special music (song and sign language) of Rend Collective’s “Strength of My Heart.” We then dismissed from the Sanctuary, along with all of our parents/families, to the gym for a beautiful signing piece from our Cherub Choir (4-5 year olds) followed by eight stations of experiential activities. Parents were required to stay with their children as they moved from one station to another. At 12noon, the stations closed and families joined up at tables (assigned tables of eight for families who registered to encourage families to make new friends) along with additional table and chair spaces for 32. With two two-sided serving stations, we served sloppy joes, buns, shredded cheese, chips, pickles, and water which folks signed up to bring when they registered. At 12:20pm we finished the event with a sing-along of Jesus Loves Me and This Is The Day (song sheets on the tables) and a rousing rendition of a JumpStart 3 song our students have enjoyed singing since the first of the year. This particular Sunday was the beginning of Spring Break. Expecting numbers to be low, we were surprised with the 85 registrations. Knowing what happened at Messy Family Christmas, I planned supplies for 125 at each station that had individual take-aways. We used everything! One of the reasons this planning freak gal likes to use the Messy Church model for creative and inter-generational stations is that not everything is a craft requiring a fixed amount of individual take-aways. Each station is not about the task, but rather the discussion and relationship-building. With our theme of JESUS IS AMAZING, the following stations were set up around the perimeter of the gym. Not all the stations were ‘manned’ since the families were to remain together. When the station was ‘manned’, it was manned by past Ambassadors (current middle school youth) or an adult (not a parent/grandparent), and the story eggs were led by a husband and wife team who shared the Resurrection story with flare, excitement, and creativity. Discussion: What do you think about Easter? What do you think about Lent? Did your family do something special for the season of Lent? Activity: Draw a cross and write your name around it on the sheet in a sharpie. After Jesus died on the cross, the women who followed Him, wrapped up His body and laid Him in a tomb (a cave carved out of rock.) What Jesus did for us on the cross is amazing! Activity: Make a word; build on a word already on the cookie sheet (like a crossword/scrabble board). Discussion: During Lent we might hear lots of new words like ‘resurrection’, ‘redemption’, ‘holiness’ which we don’t typically hear any other time of year. What are some new words you have heard? Every word points to Jesus, because Jesus is amazing! Activity: Draw symbols on your egg to decorate it so you can tell the Good News of Jesus. Cross – Jesus died on a cross, but is risen because Jesus is amazing! Star – Where is Heaven? Heaven is up like the stars are up! Jesus walked the earth for 40 days to talk with his family and friends after His resurrection then went up into the clouds to (1) prepare a place for us when our time on earth is through, and (2) to send us a helper, the Holy Spirit, to help us live a life that honors God and our family as followers of Jesus. Jesus is amazing! Activity: Have children choose a wooden cross they can keep. Discussion: Talk about why the cross is the most important symbol of Easter for Christians (Believers and Followers of Jesus). Jesus in amazing! Activity: Pick up a stone/jewel and hold it in your hand. Discussion: What’s on your mind? What are you hoping for? What are you wishing for? Pray a “please” prayer (a prayer where you ask God “please”) for what’s on your mind. When you’re done, place your stone in the bowl along with everyone else’s. Notice the growing numbers of prayers we share together. God hears every prayer, even the ones that seem small or silly. Jesus is amazing! Activity: Mold a circle/crown with the playdoh and place broken toothpicks in it to make a crown of thorns. Discussion: The first time ‘thorns’ is mentioned in the Bible is as a punishment for disobeying God’s first and only rule for Adam and Eve in the Garden of Eden. “Don’t eat the fruit of the tree of the Knowledge of Good and Evil.” Because they disobeyed and did eat the fruit from it, they had to leave the Garden and now grow their own food ‘among the thorns and the thistles.’ Now we see that a crown of ‘thorns and thistles’ were placed on His head. This is an example of what we call, “The rule of first mention” in the Bible. When something is mentioned in the Bible for the first time, it matters how and when it is mentioned throughout the Bible. What does it feel like to your fingers? Jesus loves you so much that He took the punishment for our sin (our selfishness) so we can be forgiven and learn to live a life of kindness and help for other people. Jesus is amazing! Activity: Roll marbles in paint, and then roll them over the hand towel to leave a pattern. Discussion: Talk about the stone being rolled away from Jesus’ tomb=the cave where Jesus was laid after He died on the cross. Jesus is amazing! Alrighty, then! If that’s the benchmark, I am SO not anywhere near there. I learned so much in 2018 from a whole host of platforms. Let me share with you my Top 3 of 2018 from 3 go-to platforms that has changed who I started as in January into who I am at the end of 2018. They each essentially rocked my world! The Sustainable Ministry Show presented by Ministry Architects – all about processes for everyone serving on staff in a local church from budgeting to major event notebooks to pruning ministry and more. This is for ANY ministry! MyCom Church Marketing Podcast presented by United Methodist Communications – all about marking your ministry inside and outside your local church; ideas for ‘throwing seed’ to reach communities. Be intentional about working smarter, not harder. And short! Set Apart Girl podcast by Leslie Ludy – this Jesus gal needs the words of wisdom from missionaries, saints of the faith, and the scriptures. I was introduced to Leslie Ludy as an author when my now-adult daughter was in high school and she is the real deal. Sustainable Children’s Ministry – for this ‘people and process’ girl, Annette Safstrom and Mark DeVries lay out in one place how to set up sustainable systems beneath the unforgettable moments of children’s ministry. Irresistible – Andy Stanley presents a history of the Bible and how we got it for the sole purpose of reclaiming the ‘new’ in the New Testament. The people of God serve a ‘mobile, inhabiting, Spirit God’…think tabernacle, not temple…and that’s just the beginning! Still chewing on this one. Messy Church – Lucy Moore puts forth a goal of building a fresh expression of community rather than accomplishing tasks in discipleship for the little people and families in the ministry I lead. McEachern Kid’s Messy Family Christmas is the direct result of how that would look in the local church I serve. More to come on this one especially on 2019’s upcoming fifth Sundays. 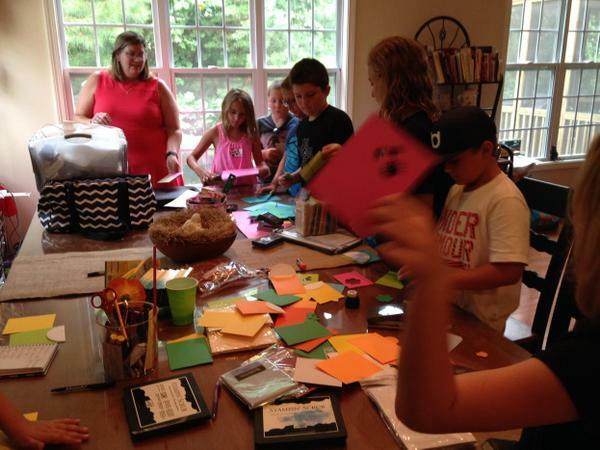 McEachern Kids Servant-Leader Team –The joy of the Lord has a gravity all its own. The team of Jesus Guys & Gals who invite me into their lives to do the work of ministry with joy and wonder make my eyes tear up and my chin quiver. These are prayerful, hard-working, hilarious, sold-out disciples of Jesus! Jesus never sent out His disciples to ‘do the work’ one at a time, but two, three, and up to 70. And OH, the stories! A year under my belt at McEachern and I am as excited for what God has in store for us together as I was when I answered the call into professional ministry more than 20 years ago. Staff-Parish Relations & My Senior Pastor – The epitome of folks buying into the vision you bring to the table is to offer assistance in ramping it up. Beginning in January, McEachern Kids will be blessed with the Marvelous Ms. Misty for 15-20 hours each week. Praying for ‘more’, then letting the Lord decide what ‘more’ looks like for the last 8 months. The support of a senior pastor and the staff-parish relations team can make or break your spirit of, “Yes!”. I pray for them. They pray for me. We don’t serve for ‘atta-girls’, but to be heard, encouraged, and equipped by the SP & SPR can give strength when you’re weary and courage when you’re…well, not courageous. 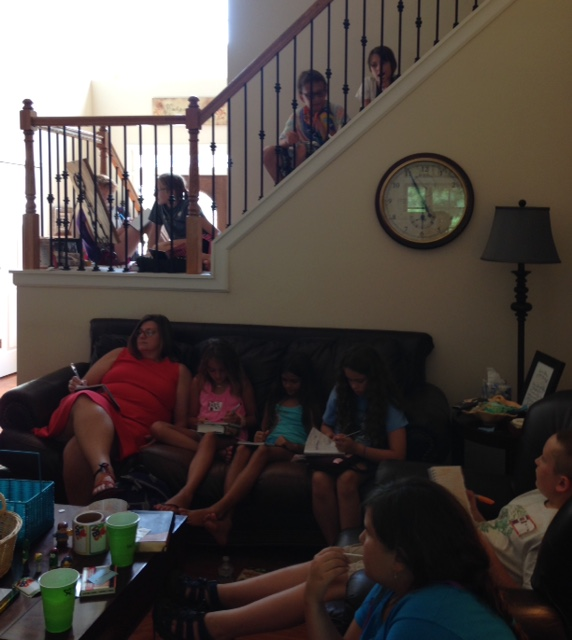 Atlanta-Marietta District Children’s Ministry Networking Group – We’ve met monthly for almost 20 years. Some of the faces have changed, but they feed my soul, make me laugh my head off, talk me off my ledge of crazy, and throw seed (think parable of the Seed & the Sower) like confetti. Kate and I went to the Holy Lands in February with Jesus action figures and started Faith Field Trips last summer. We’ve already met to plan Summer 2019. Sarah is the best story-teller and we connect in mini-meetings at Annual Conference like the true extroverts we are in our little corner of the auditorium. Kelly will be leading our first Wonderfully Made faith and sexuality event for the 5th & 6th graders in our district which I get to host. One is a super volunteer who brings her broken heart until she heals well enough to dock at a new port. Been there. Done that. Rebecca came to networking lunch on her first day back from maternity leave, and we ALL know what her office and in-box must look like. Michelle just started on church staff three months ago. What are you reading? Who are you listening to? Who are your people? There are a ton of fabulous books out there about themes, special events, logistics, theory, encouragement and stories for the disciple called to professional ministry with children. There are few that make ‘the shelf.’ On ‘the shelf’ are the ones I go to often as must-have resources. Rise Up: Choosing Faith over Fear in Christian Ministry, written by Vanessa Myers, is the one that has it’s own spot on ‘the shelf’ and one I will gift out to many because it will absolutely help you stay the course. My absolute favorite part of her book is how she offers an account from the Bible for each fear. When I’m afraid I need to know that I’m not the only one and this is priceless. For example, Chapter 5 is entitled: Surrounded by Fire…Fear of Criticism. She reminds us that Shadrach, Meshach, and Abednego ‘didn’t please the king.’ She continues, ‘When you work in the church there’s not just one person you want to please, but many people. When you are being attacked in your job, it is hard…criticized by other Christians. Usually when people complain about you in the church they don’t go to you directly. They go your pastor or a committee.’ Yet she found comfort as did the three young men in the fiery furnace. ‘The first step into walking through the fire was to forgive. The next step I took was to allow God to be my shield. God’s presence was there. God’s love was there. God’s protection was there.’ As reminded in Psalm 3:3-4, David writes “But you, O Lord, are a shield around me, my glory, the One who lifts my head high.” Whew! I’ve got to get that on a pillow! Seeking the Lord requires good spiritual disciplines or habits. Yes! His calling for your life is important, but His desire for you to know Him trumps all. Yes! Pressing into the Lord, I believe, involves a few steps: being aware of His presence, reading the Bible, and singing. Yes! Lack of support does not mean that I am a failure. I will always have the best supporter on my team, Jesus Christ. Amen! When I asked Vanessa if she was surprised by anything since she’s put the book, er..her heart out there. She said, “My biggest surprise is how the book has been speaking to more people than those in the ministry. God is using it to speak to people who need to hear it right when they need to hear it.” I am so glad she obeyed the Lord and wrote this book….for herself…and for US! You can order your own copy at Amazon AND you can win a free copy of Rise Up: Choosing Faith over Fear in Christian Ministry by commenting below with a scripture which has helped you to rise up and serve the Lord. The winner will be announced on next Tuesday’s blog. Your heart and your ‘shelf’ needs the words shared in Rise Up. The free book give away week is complete. The winner is Jen Clark, a children’s pastor who serves Mountain View United Methodist Church in Marietta, Georgia. 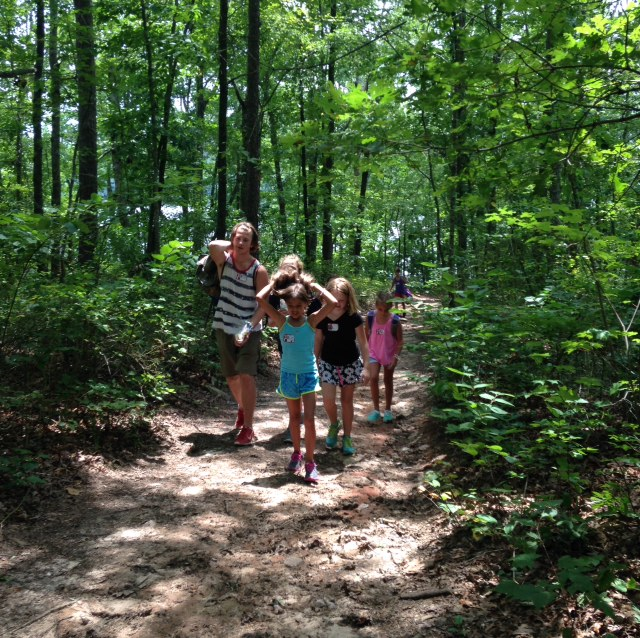 Many traditional churches offer week-long day camps during the summer as part of their ministry with children. We are planning one the last week of the summer and our recreation department has a slew of great ones. I wanted to offer a very intentionally memorable faith-formation experience, developmentally appropriate for kids k-2nd and 3rd-5th, in partnership with another church because ‘we’re better together’, and take kids outside where Jesus likely spent most of his growing up years. Logistically, the trips are scheduled 9am-2pm. Kids brown-bag their own lunches, wear water shoes, and bring a refillable-water bottle, sunscreen, a towel, an open mind, and a spirit of adventure. Each trip is $20 per student to cover transportation, expenses, destination fees, and chaperone expenses. My colleague from a partnering church and I engage in lots of conversations with the children about the faith-formation theme of the day, then share a Bible lesson about halfway through lunch. 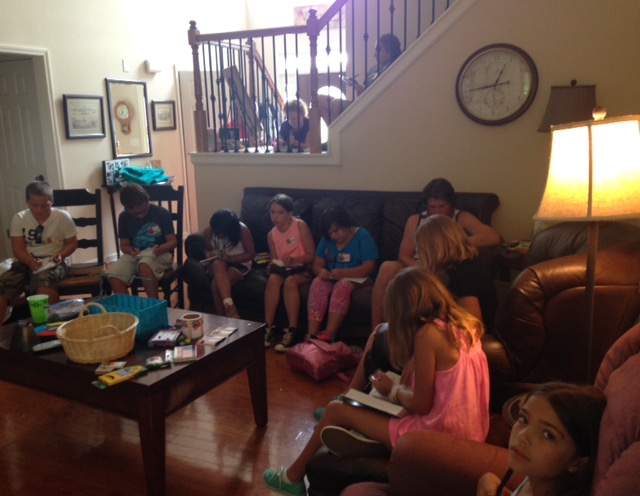 Ms. Kate opens a Cluster group for each trip for us all to post photos which parents can see. I even try to send photos to parents/grandparents by text throughout the day or by the end of the day. Ms. Kate calls her trips ‘tours of faith.’ I call mine ‘faith field trips.’ Our families call it ‘a whole lot of fun’ as they continue the conversations at home. Lynley Jones of Asbury UMC in Lafayette, Louisiana is a KidMin Ninja and incredibly creative in how she shares Jesus with little people. Thanks to this dear colleague who shared pictures and her organizational tricks with me, WC Academy started the first of four life skill classes for 1st-5th graders. WC Academy is a free community outreach of WCKids. We created the event on Eventbrite for free registration and to gather information of ages, names, and emails for a Friday night 6-7:30pm. 6:10-30pm: Amazing volunteers (3 middle school youth and 3 adults) introduced themselves and told an interesting fact about themselves. We then welcomed and gave instructions. 6:30pm: Students received packets of handouts (all found on pinterest and noted below) to be used at each station and began rotating every 10 minutes. After the 3rd rotation, we gathered for hot chocolate and I shared the story of Jesus making the Leper clean from Mark 1:40-42…including the shouting of “UNCLEAN! UNCLEAN!” Jesus makes us clean on the inside. Then we finished the last two rotations. 7:15pm: Huddled to give testimony about what we learned, favorite station, and what we can’t wait to demonstrate as soon as they get home. Handed out certificates (what’s an Academy without certificates?) and celebrated with an all-hands-in cheer at dismissal. Folding Clothes Station: My adult daughter does this ninja-tshirt-folding-thing and sock-roll that totally amazed each student. Yep…one of their favorite stations. We received texts from parents later that night about students teaching their parents how to properly fold clothes! Supplies: kid sized tshirts and white tube socks. Dusting/Sweeping Station: Set up in the corner of the room with a little baby cornstarch (with lavendar for obvious reasons) and Lego bricks to dust. Then to sweep up what fell on the floor. A huge mess by the end of the night, but with all the wet towels and washcloths from the dishwashing station, the students cleaned up the floors pretty well. Supplies: Baby Cornstarch, a few Lego bricks, 2 brooms, washcloths. Bed Making Station: Set a twin top mattress on a long table and had the Eagle Scout teach how to make the bed with hospital corners. Interesting fact: Not one of our kids knew the bottom sheet was called a ‘fitted sheet.’ Supplies: twin top mattress (put out a request on facebook), mattress cover/case, top sheet, fitted sheet, pillow, pillow case. Dishwashing Station: Learned the order in which dishes should be handwashed and how to load a dishwasher. We used a single sink and a dish drainer. Supplies: Dish drainer, bowl, silverware, 2 glasses, saucer, washcloths, dish detergent, gloves. Ironing Station: Set up two ironing boards in an adjacent room with irons on lowest setting and ironed a washcloth first. Using the directions in the packet, students ironed a dress shirt and hung it on a hanger. Supplies: 2 ironing boards, iron, hangers, two dress shirts, 2 washcloths. What do we do after handing out a slew of new Bibles to 3rd-5th graders? We schedule a late night (6:30-9:30pm) on the following Friday for 3rd-5th graders to learn to use this new gift. Using the hugely popular tv show American Ninja Warrior as our theme, we set up bible and physical challenges that go together. Brainstorming for this event with another kidmin champion made for an awesome night. The plan was to have it outside, but a rainstorm called for plan B – our gym. Students were instructed to wear red, white, and blue, bring a towel (to lay on during the silence time), bring a bible (that’s why we’re here, but have some student bibles handy just in case someone forgets), bring a water bottle (the kids got thirsty quick), and use free Event Bright registration for signups (this made for quick notification emails of the change in venue and intake location). Arrival activity: let students write names on headbands with a sharpie or a name tag for those who wore their own headbands, and lots of jump ropes. purple=to mark Romans, the first letter book in our Bible. Quintuple Steps – Discussion and overview of the Bible. How did the Bible come to be? Play the telephone game (oral tradition). The story of the Bible is about God and how God acted in people’s lives then and now. Run the Quintuple side steps without touching the ground. Agility Ladder – Creation – Genesis 1…We serve a God of order & systems. We made a creation trail mix to save for later for snack and used an agility ladder to run through the 7 days of creation in order. Joke: Where does the Bible talk about baseball? Genesis 1:1 “In the big-inning.” Then back to the bible study tables. Flip the Tire – The Torah is the first 5 books of the Bible. Was originally written on scrolls (rolled up paper). Genesis, Exodus, Leviticus, Numbers, Deuteronomy. Flip the tire 5 times and say the books that make up the Torah. Over Under PVC Hurdles – God gave His people the 10 Commandments to live well with one another. Look up in Exodus 20 & Deuteronomy 5. Run under the pvc hurdles for the ‘do’ commandments and over the pvc hurdles for the ‘don’t’ commandments. Then speak loudly reading the commandments from a 10 commandment poster taped to the wall. King of the Mountain – Look up the 4 gospels: Matthew, Mark, Luke, John. Step from stump to stump without falling off. Hula Hoops – Look up Matthew 10:2-4 and discover the 12 disciples. 4 stations of hula hoops. Jump through each hoop 3 times each saying the disciples/apostle’s names. Walking the Plank – Look up Luke 11:1-4 The Lord’s Prayer. We’ll discuss the many aspects of prayer using a gift from Mark Burrows, the Children’s Ministry Lead at FUMC of Ft Worth, WITH (Wow, God….I’m sorry, God….Thank you, God…Help me/another, God), then a 10 minute period of silence. Walking raised lengths of wood for balance beams. Silence – At some point on the course have a rest time for a period of silence (10-15 minutes, depending on time) to eat the trail mix and a cold Powerade on their towels spread throughout the space. Drag A Tire – Look up the Parable of the Good Samaritan in Luke 10:25-37 and discuss who is my neighbor. Drag a tire with a rim by rope across a long space. Closed out the evening with awards of “Take 5” candy bars on 1/4 inch ribbons as we discuss taking 5 minutes each day to read the bible and pray. Location: At my house along with other CLUB345 adults, 10am-9pm….I live so far away from the church, it’s a very special treat to come and spend the day at my house for my students. What the kids bring: A bag to carry everything in, swim suit, sunscreen, refillable water bottle, towel, pen, Bible, walking shoes (for the hike to the reservoir), flipflops (shoes for the pool), bag of favorite candy for popcorn bar. Lesson 1: A Heart That Chooses Friends Wisely (Jonathan & David)…Spiritual Gifts Inventory from Credo …A True Blue Friend (Naomi & Ruth). This spiritual gifts inventory relates to body parts and makes the ‘gifts’ more relative to students. It was a great encouragement for the students to hear about the best parts of them which are gifts of the Holy Spirit truly from the Lord. 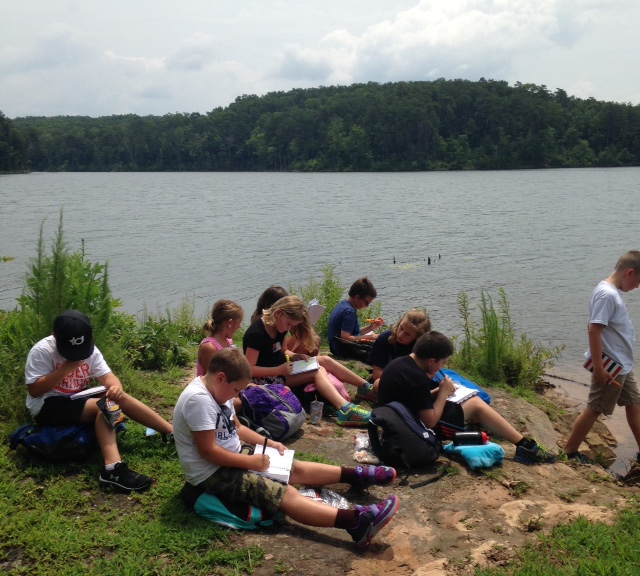 Students made sub sandwiches and we hiked to the local reservoir for a picnic lunch. Be slow to anger. Proverbs 15:18 A hot-tempered man stirs up dissension but a patient man calms a quarrel. Be slow to respond by not interrupting Proverbs 18:13 She who answers before listening that is her folly and her shame. Avoid quarreling. Proverbs 20:3 It is to a man’s honor to avoid strife, but every fool is quick to quarrel. Speak gently. Proverbs 15:1 A gentle answer turns away wrath, but a harsh word stirs up more anger. Speak briefly. Proverbs 10:19 When words are many, sin is not absent, but she who holds her tongue is wise. Be quick to show love. Proverbs 10:12 Hatred stirs up dissension, but love covers over all wrongs. But if necessary, rebuke rather than flatter. Proverbs 28:23 He who rebukes a man will in the end gain more favor than he who has a flattering tongue. Be alert to give service – what counts most is what we do for others! They are God’s gift to you and believe me, no one loves you more or cares for you more deeply and genuinely than your very own mother and father. 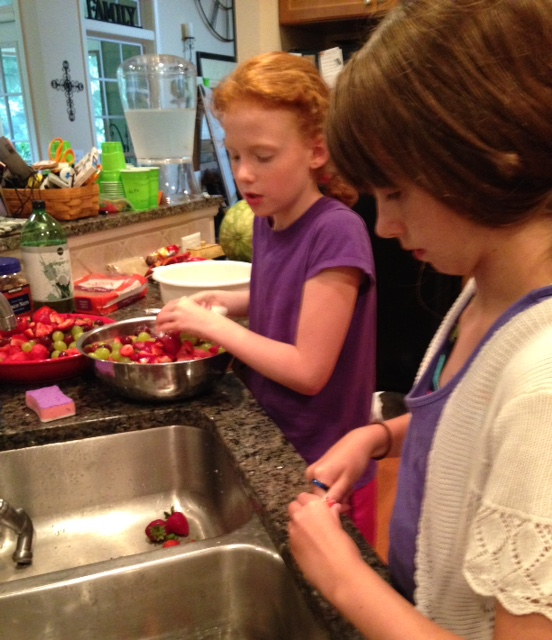 We prepared dinner of fruit salad and deep dish pizza and enjoyed fruit sorbet for dessert. After several heated games of Pit, laughter, sharks & minnows, line tag, and popcorn fun, we are already planning next year’s event. Of course we wear our tshirts to church the following Sunday. Watching The Passion Live through the streets of New Orleans got me to thinking about family traditions. South Louisiana was my home during my teen through my young-married years. The creativity had me glued to my seat throughout and I eagerly downloaded the soundtrack from iTunes midway through. I don’t remember much of Easter Sunday as a child. My parents were very active as Sunday school teachers in our local church until their divorce when I was 10. In my teen years we engaged in a wild Easter egg hunt with a money egg, ate ham, made multi-colored egg salad, and a basket of beautifully painted ceramic eggs decorated the center of our family table. When Baby Girl and #1 Son were little people, our Easter celebrations centered around an all-day church day with food, dressy clothes, fantastic music, and lots of kids in Sunday school as we lived in New England. By the middle elementary years, we were in the Atlanta area and we joined a church that celebrated a season of Lent in addition to Resurrection Sunday. We began a new family tradition of attending the Sunrise service in the parking lot on our own lawn chairs with hot chocolate. The adults didn’t dress up and most of the kids were still in pajamas. It was intimate. It was different. It was powerful. We sang the same songs every year and huddled under blankets to keep warm. The message was delivered by a lay person who has now answered the call into full time professional ministry and leads a spirit-filled church about 20 minutes away. Frankly, that sunrise service was the most uncomfortable service of the year… we remembered it….and we loved it. Serving on a local church staff, there are now multiple services. Lots of planning. Lots of flowers. Lots of greenery. Lots of beautiful music and lots of preparation for church guests and church family. But it’s the Sunrise service that makes my Resurrection celebration. Now I’m the one to stop at the Quick Trip to fill the pump carafes with hot chocolate (just a few dollars to fill each one), roll a cart with sleeves of Styrofoam cups and paper towels to the outdoor site. People walking their dogs, stop and take a seat. We sing. We shiver in the cold. We hear the old, old story of Jesus and His love. What are your Easter Family traditions? Milestones are the significant cultural and developmental markers that we experience throughout our lives. They are our firsts. Growing in faith is not just a Sunday morning activity. It’s part of all we are and all we do as God’s beloved people. But there are firsts, milestones, rights of passage with specialness wrapped around those firsts in a lots of ways. We have prepared an ordered format of FAITH MILESTONES to have intentional firsts throughout a student’s experience in our ministry with children at WC. 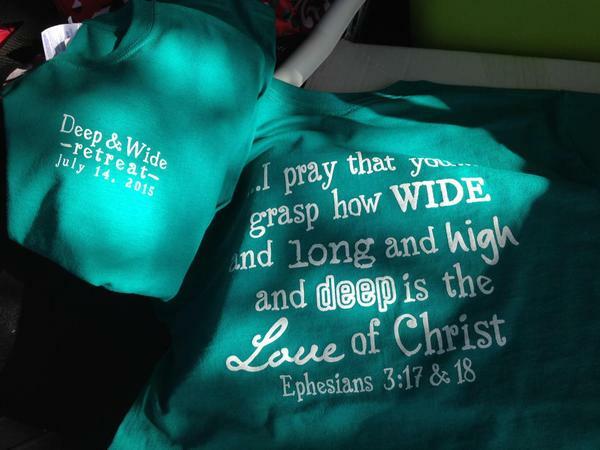 The Deep & Wide Retreat is our first retreat. A retreat is time away from our normal life for the purpose of connecting with God on a deeper level. Faith is formed through personal and trusted relationships and times of stretching and challenge. 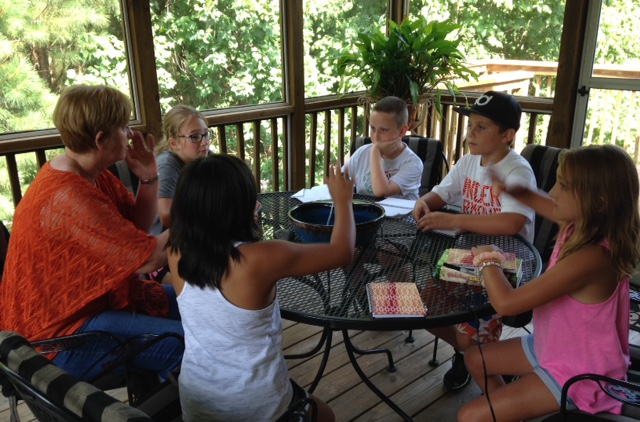 Jesus started with a few disciples who gathered in their homes so A Day Away At Ms. DeDe’s seemed the perfect setting for a first retreat to do some soul training for my rising 4th and 5th graders. 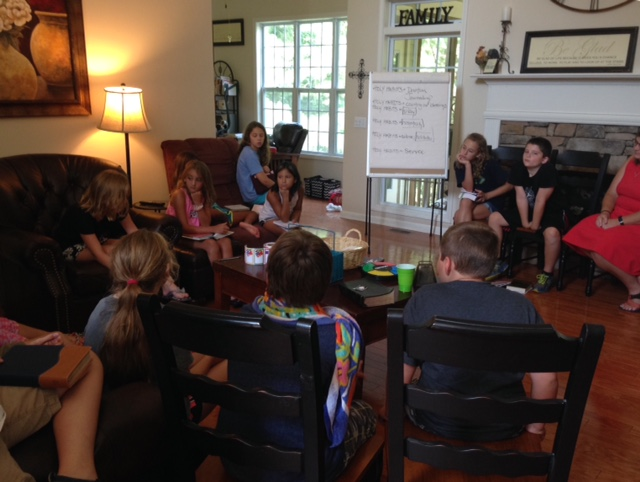 We invited a colleague to bring her rising 4th-5th graders to join us for greater large/small group dynamics. Location: Ms. DeDe’s home. I live 40-50 minutes north of our church community in a subdivision with a reservoir and a community pool. Opening my home to my family of faith is table life that I love. 1. How did you get your name? 2. What is your first memory of church? 3. When you talk on the phone, it’s a habit to have a visual image in your mind of who you are talking to. When you pray, the same thing could happen. What does God/Jesus look like in your mind when you pray? 4. What are some faith practices of your family from birth to now? 5. What is an experience that let you know that God is real? 10am: Arrival/Introduction Games – Name Wave (say your name and do a motion – everyone repeats the name and motion one at a time moving around the circle until everyone has introduced themselves and everyone has said everyone’s name); Hand Who? (invite each student to draw an outline of his/her hand on the journal given to each one, then for each finger write something interesting: thumb-something you do well/thumbs up, first finger-something that makes you stand out from a crowd, middle finger-something that frustrates you/pet peeve, ring finger-something you are committed to/passionate about, pinkie finger-a little known fact.) Then, we broke up into 2 groups by church to share. 10:30-11:30 Session 1 – Soul Training: Holy Habits…devotion & journaling & bible study…The most important thing a human being does is to love God. (A Good And Beautiful God by James Bryan Smith) We handed out Mood Rings (amazon.com) that change color according to the mood of the wearer. What if someone made ‘love-of-God’ rings indicating the level of love the wearer feels for God? And what if everyone had to wear them? What color would yours be? Ephesians 3:17-18 God’s love is wide (covers all of our experiences and the whole world), long (continues the length of our whole lives), high (rises to the heights of our celebration and elation), and deep (reaches to the depths of discouragement, hurt feelings, despair, death/loss, feelings of being shut out or isolated.) We shared examples of each. Our soul training and holy habits are expressions of how wide, long, high, and deep OUR LOVE is for God. Took 15 minutes of silence to journal what we thought/felt. 11:30-12:30 Session 2 – Soul Training: Counting Your Blessings…picked up sandwiches and goodies for lunch prepared by our church partner and hiked to the reservoir’s edge to make a list of 100 blessings. A good way to remember that God loves us is to make a list of His blessings. In increments of 10, it’s an elephant we can eat when we take one bite at a time. (ex: reading your bible all the way through). Categories: 10 people who love you, 10 colors (God saw fit to give us more than one color), 10 items of nature that show we serve a God of order (much easier when we sat outside at the reservoir’s edge,) etc. 12:45-1:15 Session 3 – Soul Training: Play…hiked back to the pool and swam for 30 minutes. The gospel/good news includes an invitation to a great adventure. 3:30-4:15 Session 5 – Soul Training: Trust…movie debrief. Discussion in large group of our gift of emotions when did you have to ‘put your fear in your pocket’ and be stretched? 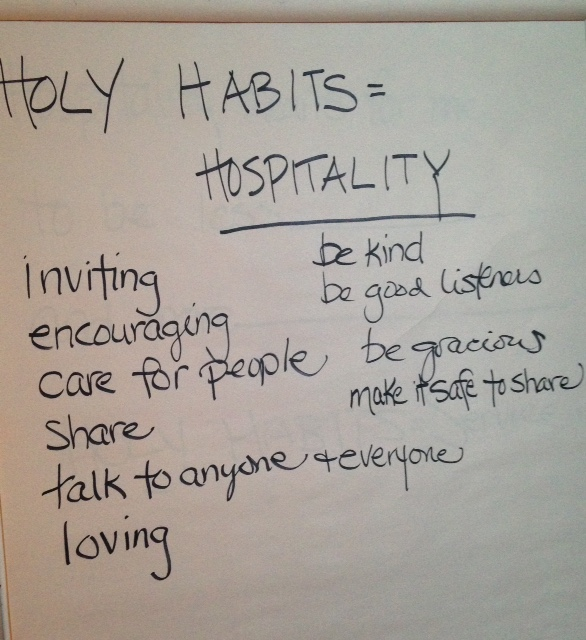 5-6 Session 6 – Soul Training: Hospitality…We are called to be a witness to the good news by speaking and greeting others. We learned how to engage in conversation/tossing the ball back and forth in large group. Then broke up into 3 smaller groups to stretch our natural tendencies to talk only about ourselves and practice carrying on a conversation using the 5 pre-retreat questions. 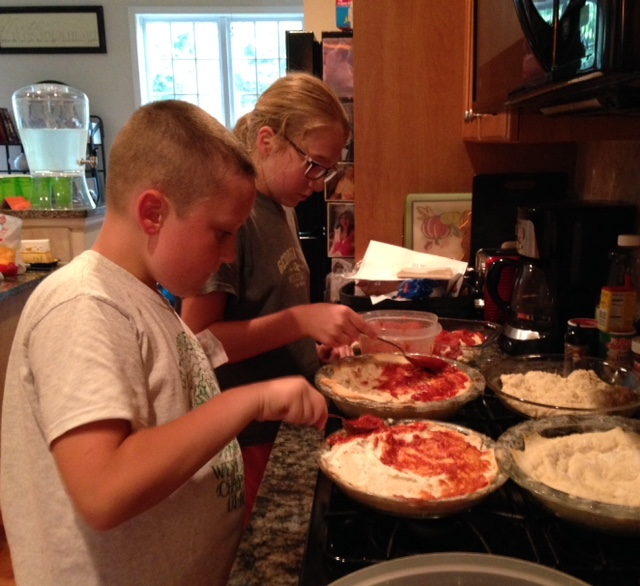 6-6:45 Session 7 – Soul Training: Service…My team made deep dish pizzas and wide fruit salad for supper while the other team made handmade cards for each church’s shut-ins. We shared what a shut-in was and what to write to someone you don’t know, but want to encourage in the Lord. When my team finished their task, they, too, made and wrote cards to our church’s shut ins. 6:45-7:30 Session 8 – Soul Training: Table Life…ate dinner! We were stormed out at the pool, so we played on the playground eating dessert until the lightning started. Our partner church returned to their church. We headed back to my house for a rowdy game of Apples to Apples until their parents came to pick up. Our first retreat was everything I had hoped and more. I got to share my home and heart with the students who God has gifted me for a season. We laughed, were stretched, worked, served, hoped, challenged, helped, shared, and made memories. Spiritual and sticky memories are what I like best!